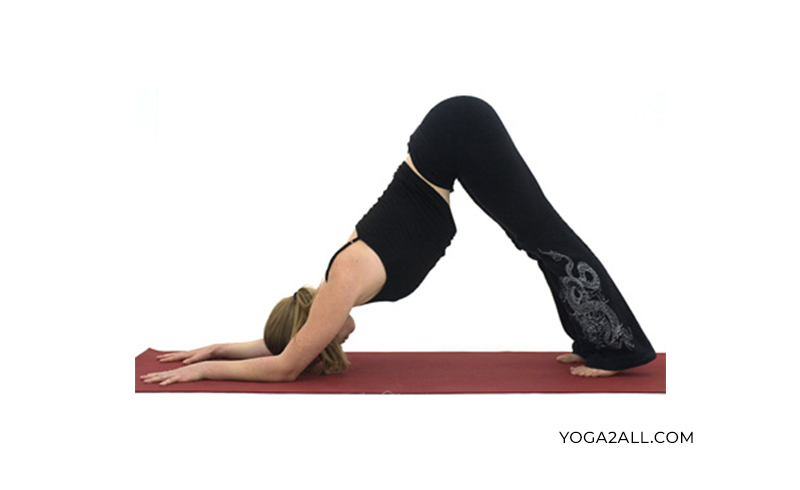 Dolphin pose is one of the most important yoga poses among all the yoga styles. If you want to know Dolphin Yoga Pose Benefits keep reading. If you cannot practice Downward Facing Dog yoga due to wrist pain or carpal tunnel syndrome, he/she can practice this pose which is called Dolphin Pose. This yoga pose is done on the forearms, which relieves wrist pressure and it provides all the benefits of Downward Dog pose. People who lift weights, draw, work on a desktop or a laptop, play sports, play guitar; they are quite familiar with sore wrists. Besides that, women who are conceiving often have to face carpal tunnel syndrome, and in this case, Dolphin Pose is very useful to their regular prenatal yoga practice list. This pose is also known as Puppy Pose. At first, begin on your hands and knees. Now set your knees directly beneath your hips and your forearms on the floor placing your shoulder directly above your wrists. Remember, you have to keep the fold of your wrists parallel to the top edge of your mat and firmly press your palms together, pointing the middle fingers directly forward. Then put down your elbows to the floor straightly beneath your shoulders. You have to keep your forearms parallel to each other on the side edges of your yoga mat. Then distribute your body weight equally across both forearms. Now curl your toes under, next exhale and lift your knees off the floor. At first keep, your knees bent slightly and the heels lifted away from the floor and broaden across your shoulder blades. Now lift your pelvis up towards the ceiling and draw your sit bones toward the wall behind you. Then, slightly start to straighten your legs. Keep your torso and legs into the shape of an ‘A’. But do not walk your feet closer to your hands and hold the extension of your whole body. Keep your head between your upper arms and do not let your head hang or press firmly on the floor. If your upper back is started to round around, then bend your knees again until your spine gets straight. Now draw your shoulder blades into your upper back ribs and toward your spine. Then widen across your collarbones. After that, keep your ears parallel with your upper arms. Now relax your head. Fix your eyes between your legs and toward your navel. And hold this position for 5 to 25 seconds. 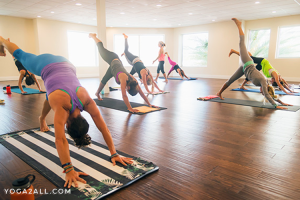 To release, exhale and gently bend your knees and come back to the floor. Then press back into child’s pose to take rest. Dolphin Yoga Pose Benefits: It is very helpful pose to stretch hamstrings, calves, and arches. Dolphin pose helps to open up your shoulders, chest, and inner armpits. It tones up core muscles, helps to regulate digestion.